Happy Birthday, Edgar. Today, the man-- who's work I was initially drawn to in childhood because it was dark, different, and drawn back to as I grew older because I came to realize so many of the things he understood so beautifully-- would have been 203 years old. 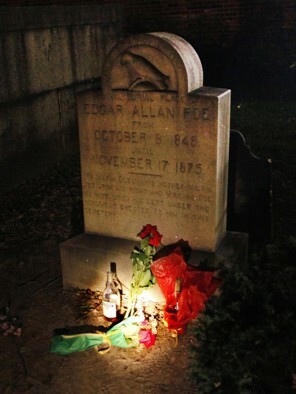 There's something sadder about this birthday, however; a sadness one might see Poe himself as having dreamed up. The man who lived his life and wrote his work tormented by and fighting against the raven-- that specter of eternal sadness, of absolute death-- would, I think, find this almost fitting. While Poe's work has gained him an immortal status in the literary canon and following throughout the world and history, it is the personal nature of his writing which, I believe, draws readers time and again to him. And that has much to do with the tradition of the "Poe Toaster." As I have written about here these last few years, from the 1940's until 2009, an unknown man dressed in black would, in the early hours of the morning night of Poe's birthday, leave a bottle of cognac with a rose at the poet's grave. Fans of Edgar would wait all night to witness the event, and this tradition lasted more than 60 years. In the 2000's, however, it became rumored that the original toaster had passed away, and left the tradition to a son or some different person. This new toaster created some controversy, including notes indicating political beliefs and opinions on sports teams-- which, it appeared, seemed to go a long way in turning many off to what the tradition had become. While people have gathered to keep watch for Poe's toaster these last three years, no such man in black has shown. And this year the Poe House and Museum curator declared the tradition officially over. Though I doubt that declaration will have much sway over the die-hard fans; people who, I can so easily see, would return year after year to the Baltimore cemetery, just in case the toaster were to return for Edgar. I hope one day I'm one of them.